This is a review of the product TRX2 by Oxford Bio Labs. The manufacturer of this product claims that it is a natural hair loss treatment which has been designed specifically for people suffering from the early stages of hair loss. The manufacturer also claims that it can stop the loss of hair and also promote the growth of new hair. Read on to learn more about its ingredients as well as our opinion of whether it is the right product to take for the growth of your hair. Other ingredients include Hydroxyl Propyl Methyl Cellulose and Magnesium Stearate. It is recommended that adults take three capsules of this product daily, preferably with food and water. The side effects of this product include allergic reactions such as skin flush and in rare cases some consumers have also reported gastrointestinal effects like an upset stomach. Therefore, you are advised to not take this capsule on an empty stomach. Those people who are suffering from a digestive system disorder should only take this product after consulting with their doctor. Similarly pregnant and lactating women should also avoid this product. In case of an allergic reaction to any of the ingredient in the product, you should contact a doctor immediately. The price of one bottle of this product is listed as $66.95 on the company’s website and includes 90 vegetable capsules which are enough to last a full month. The manufacturer also offers a discount of $6.95 per bottle, if you order 3 bottles of this product as well as a discount of $55.65 per bottle and free shipping if you obtain the hair treatment club membership. The manufacturer of this product does offer a strong money back guarantee and states that if you are not satisfied with the product and if it doesn’t show the desired result then you can return the unused bottles within 60 days and you will be provided a full refund. However, there are no reviews of this product on the company’s website which makes it a tricky choice. 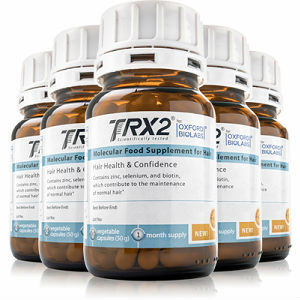 TRX2 by Oxford Bio Labs is a hair loss treatment program which has been formulated by the scientists of Oxford. The manufacturer of this product claims that it can stop the loss of hair and provide a significant improvement in the texture and thickness of the hair. It doesn’t interfere with the hormones and can initiate a steady regrowth of hair on the temples and the front area. However, it is only effective for the early stages of hair loss and would have very little effect on the advanced stages. There are also no reviews of this product on the company’s website and so this may not be the best product for you. John Brownstone	reviewed Oxford Bio Labs TRX2	on July 29th	 and gave it a rating of 3.